Just ahead of IMSH 2019, Simulab has announced their new AirwayMan Trainer after showcasing their new ArteriaLine Simulator at ASPIH 2018. At UK’s premiere simulation event in November, Sales Director Stephen Hertz was on hand for this exclusive video demonstration of Simulab’s new ultrasound-guided radial artery catheterization and ABG trainer, all before the very recent announcement about their new AirwayMan Trainer — which will be on display at SSH‘s International Meeting for Simulation in Healthcare 2019 event! Watch the video below to learn more! Priced at just $2,500.00, AirwayMan is Simulab’s new complete airway management training system. Learner can practice and train for complete airway management from nasal and oral intubation – to needle and surgical cricothyroidotomy. AirwayMan offers low cost, replaceable soft tissue components for increased realism and extended product life. Every part of AirwayMan is carefully engineered to recreate the familiar movements, textures and delicate nuances of human anatomy. AirwayMan includes the same realistic cricothyroid structures found in TraumaMan—the most widely used cricothyroidotomy trainer in the world. Learn complete airway management from nasal and oral intubation – to needle and surgical cricothyroidotomy, while visually confirming key landmarks: functioning epiglottis, vallecula, and vocal cords. 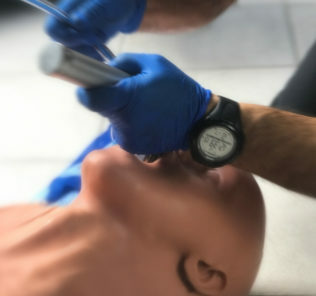 Practice patient positioning and assess strength needed for each procedure and proper technique for laryngoscope insertion — with ability to confirm intubation with auscultation and simulated chest excursion. Finally, your educators can also detect intubation errors including Right Mainstem Intubation! Practice Ultrasound Guided Arterial Catheterization and ABG Sampling with the new Simulab Ultrasound ArteriaLine and ABG Trainer. With this true to life hand and arm model, users can safely practice arterial cannulation, ABG and arterial puncture in order to complete continuous blood pressure measurement and blood gas sampling in critically ill patients. The new Simulab Ultrasound ArteriaLine and ABG Trainer allows educators to train ultrasound-guided radial artery catheterization and perform ABG sampling. This trainer brings medical simulation to new levels with variable pulse strength and rate, palpable landmarks, sharp ultrasound imaging, and arterial pressure that fills and ABG sampling syringe. 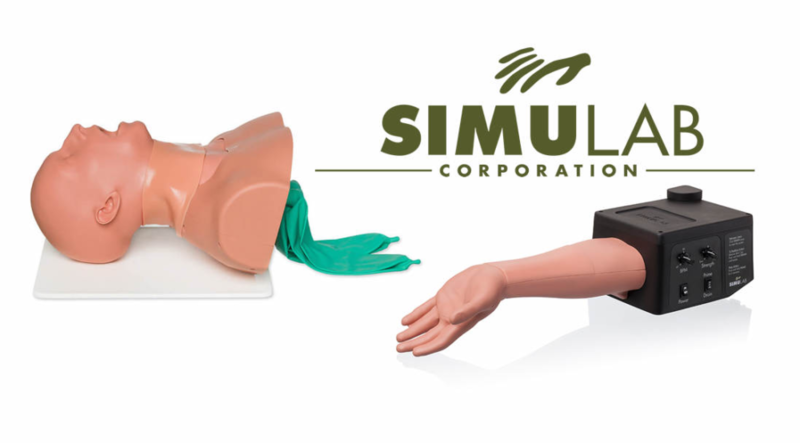 Simulab is a medical simulation company, dedicated to replicating human anatomy, and turning it into realistic, easy-to-use training tools that help save lives. By collaborating closely with leading educators world-wide, leveraging over 25 years of experience and constantly pushing the boundaries of realistic tissue discovery, Simulab has become the market leader for realistic and affordable trainers for a vast array of healthcare simulation models. Their mission is to create a human mimic so perfect, participants feel truly immersed —in every procedural training. Just touch their tissues to feel the difference. You’ll see they look, feel, ultrasound, suture and bleed just like human. Learn more about AirwayMan & ArteriaLine Trainer on the Simulab Website Today!